UNIVERSITY PARK — It’s not just your house or apartment that might need sprucing up this time of year. Your finances can benefit from a spring cleaning, too. April is National Financial Literacy month, and Penn State financial literacy manager Daad Rizk recommends taking the opportunity to clean out your financial clutter, both electronic and on paper. ■ Identify what clutter means to you. If your desk is covered with stacks of paper but you can find what you need when you need it, then it may not be clutter. But, if the piles are stressing you out, that’s clutter that needs to be tackled. ■ Collect documents in one place and sort by category (bills, pay stubs, tax forms, warranties and user manuals, etc. ), decide which documents are permanent, which are temporary and which you don’t need. If you can get a copy of a document online for free, you don’t need to keep it. Throw out ATM, charge card, grocery and miscellaneous receipts once they are reconciled with your monthly statements and budget. ■ Create a financial emergency kit. Keep permanent records in a designated folder that you can get to if the unexpected happens. Permanent records include: marriage licenses; divorce or separation agreements; birth certificates; death certificates; Social Security cards; passports; wills, living wills and advance medical directives; trust and estate documents; powers of attorney; deeds; and records of paid mortgages. ■ Keep these documents for one year: pay stubs, for comparing to W-2 and Social Security records; utility bills, unless using for taking a home office tax deduction; canceled checks and bank statements; and quarterly investment statements. 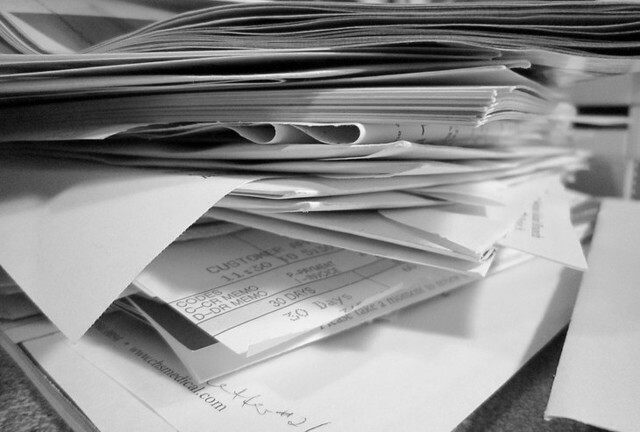 ■ Keep these documents for three years: income tax returns (you may want to keep these indefinitely); medical bills; canceled insurance policies; records of selling a house or stock; receipts, canceled checks and other documents that support income or deductions on your tax return; home improvement records; and annual investment statement (keep for three years after selling investment). ■ Keep documents showing you have paid off student loans or other loans for seven years. ■ Keep current, active documents such as contracts, insurance policies, stock certificates, records of pensions and retirement plans. When you receive a new version of an insurance policy, throw the old one out. ■ Review your W-4. If you were owed a refund or owed money, recalculate your federal withholding to make the gap between your liability and your withholding as small as possible. The withholding calculator at www.irs.gov can help you determine the right withholding amount. ■ Review investments and bank accounts to see if they should be consolidated or closed. You don’t need more than one or two bank accounts (checking and savings). If you don’t have a savings account at all, now is the time to open one. ■ Review credit cards and credit reports. Request your free annual credit report from www.annualfreecreditreport.com and review it for errors. Choose two or three credit cards to help you build a healthy credit history, and plan to pay your bills on time and in full each month. ■ Clean out your wallet. Make copies of your credit cards — front and back — and keep the copies in a safe deposit box or fire and waterproof box in a safe location in your house. ■ Designate a drawer or cabinet for paper financial records, and a space on your computer hard drive for electronic information. Don’t forget to back up your hard drive.